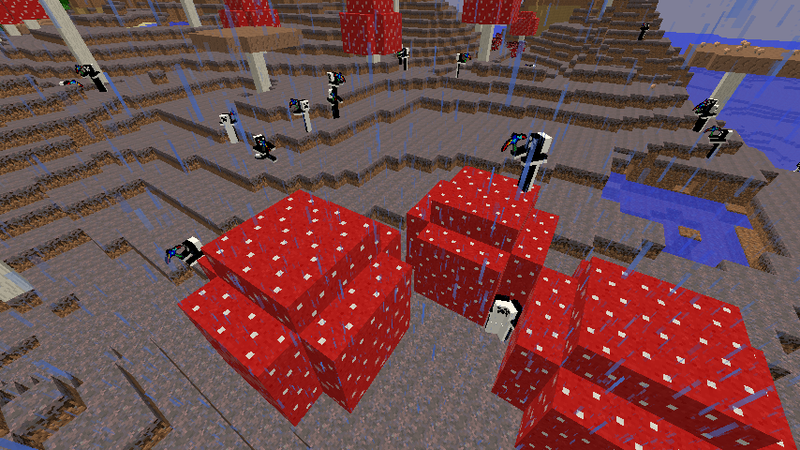 Dimension Guards in a mushroom biome. Three biomes put together, along with the portal. Showing all of the mod items, armor, tools, portals, and blocks as of Alpha 1.5. Structures - "Small Mountain", "Rainbow Wool Ore House"
If you decide to get the mod and not go into the dimension, you may not have much happening to you, except for an occasional new ore appearing. 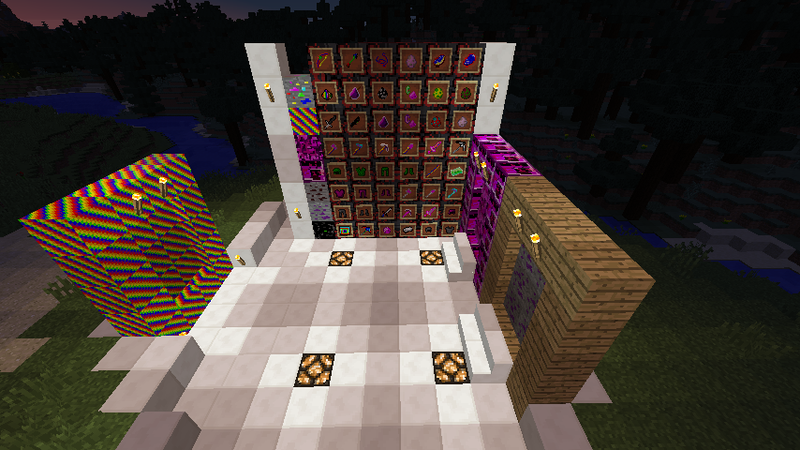 Alpha 1.0 - Dimension Guard (Mob), Charorite Tools Tab with Charorite Ore and Charorite Ingot, Benandronite Ore and Benandronite, Charorite Rainbow Pickaxe, Rainbow Portal Igniter, and the Insanity Dimension itself. Alpha 1.1 - Insanity ore added (which is currently useless), two minor issues fixed, Benandronite now has tools and armor with recipes, and Charorite also has armor with recipes, mong with the 2 tools from 1.0. Alpha 1.1.1 - Dimension Guards now attack the player. Alpha 1.2 - Color stick, one structure, and Insanity Ore armor and ingot added. Alpha 1.3 - Added use for the color stick. 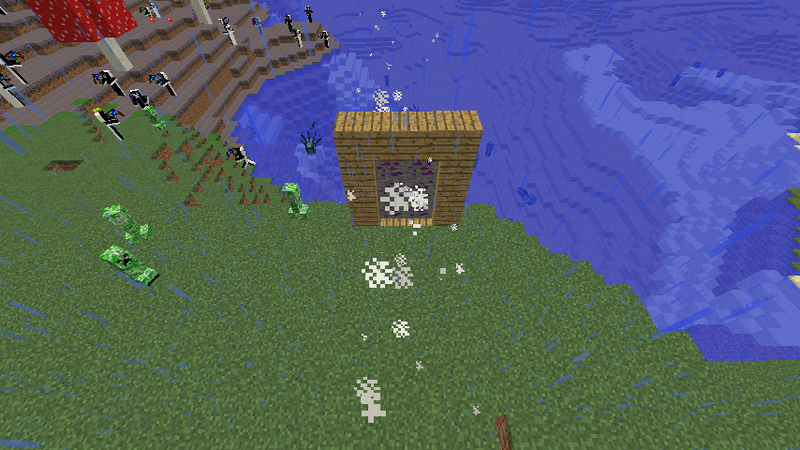 (Not craftable yet, but it will be made from rainbow dust as soon as I can make a mob that drops the dust.) Color stick makes Benandronite tools enhanced, and has a...special...effect on Charorite ones. Oh yeah, there's also a rainbow wool house with ores that may or may not have working redstone lamps depending on how and where it's placed. Alpha 1.3.1 - Biome from version 1.0 now spawns in the Insanity Dimension, and the igniter is in the Insanity Dimension tab. Alpha 1.4 - A Benandronite block, Benandronite gravel, Benandronite & Blindronite, and a Benandronite dimension. So, yeah, the Benandronite update, basically. Alpha 1.4.1 - Fixed Charorite ore textures (finally), Benandronite gravel falls, and you can turn a Benandronite block back into 9 Benandronite. Alpha 1.4.2 - Added Sweet Spiders, which only spawn in the Benandronite biome. They drop nothing but rainbow dust, used to craft color sticks. Alpha 1.4.3 - Added a new mob called Smiley, or Smiley the Maniac. He can kill a player in one-hit, so it's best to use bow and arrows. Also fixed Dimension Guard's drops (making them less OP), and health. Alpha 1.4.4 - Fixed the spawn frequency of Benandronite gravel. Alpha 1.5 - Spawn frequencies of ores are higher, new rainbow dimension with a rainbow creeper, rainbow zombie, and rainbow pig, rainbow blocks everywhere, the new rainbow ore in nearly every dimension, a rainbow biome, rainbow string, and a rainbow bow and arrow. Sweet spiders drop rainbow dust and rainbow string now, and the Insanity Dimenion and Rainbow Dimension portals do not constantly shoot particles everywhere. Alpha 1.5.1 - Fixes the flint & steel for the Rainbow Dimension, making it craftable. Alpha 1.5.2 - Rainbow dust now creates 2 sticks instead of 1, and sweet spiders should spawn more. Alpha 1.5.3 - The ores can now spawn in the Insanity, Benandronite, and Rainbow dimensions if that's where they're supposed to spawn. 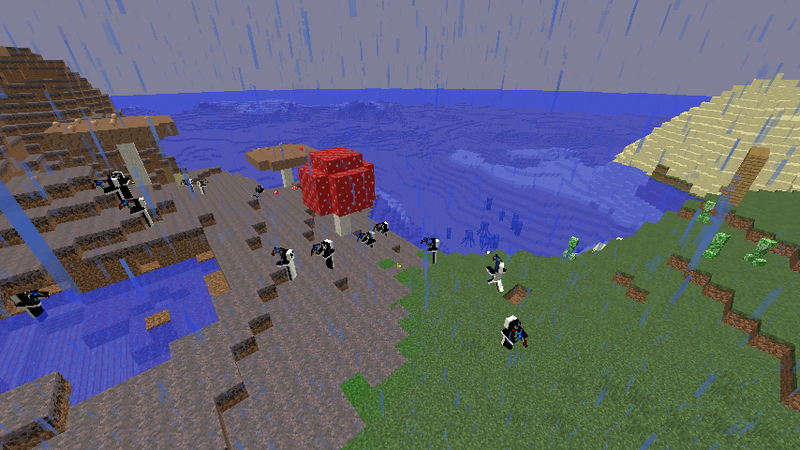 Benandronite's spawn frequency has been lowered, and Insanity ore is now possible to find. Alpha 1.5.4 - Rainbow pigs should now drop rainbow porkchops, and the Smiley and Dimension Guard mobs should have the biped model instead of zombie. Alpha 1.5.5 - Tried fixing a few spawning issues. Who know if it actually worked. Alpha 1.5.6 - Okay, NOW the spawning is fixed, I swear. Beta 1.0 - New Dark dimension, adding Dark Dirt, Dark Stone, and Dark Pigs! New flint & steel to get into that dimension, too, obviously. Looks cool. I'm going to try it out! Thanks! By the way, I'm gonna download some of your mods as soon as I can, they look amazing. What are the portal lighters for the dimensions. I mean how do you make them?